Come for this FREE talk! Do you remember Crush, the 'surfer dude' sea turtle in Finding Nemo? Wonder why they were travelling on the currents? Join us to hear and learn from Rushan about sea turtles' long-distance heroic journey from where they were eggs to their return to the sands where they were born. Come hear about the role Singapore plays in their story too! Speaker: Rushan bin Abdul Rahman is currently undertaking his honors in Murdoch University studying how flatback sea turtles pick a specific site on the beach to nest. He has worked with five of the seven species of sea turtles in the Maldives, Malaysia, and Australia, while assisting where he can in Singapore. 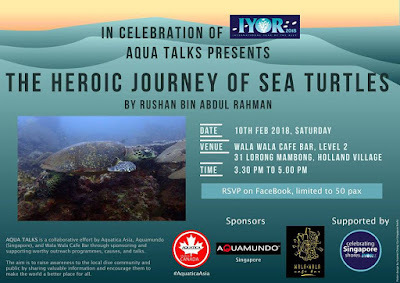 AQUA TALKS is a collaborative effort by Aquatica Asia, Aquamundo (Singapore), and Wala Wala Cafe Bar through sponsoring and supporting worthy outreach programmes, causes, and talks. 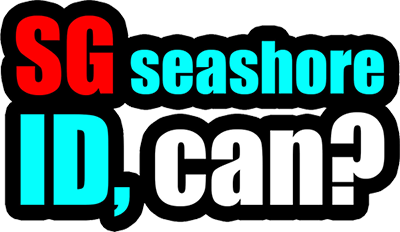 The aim is to raise awareness to the local dive community and public by sharing valuable information and encourage them to make the world a better place for all. More details and registration via the FaceBook event post.